Carpentry projects have no limitations. The use of composite materials gives us the ability to create curves and many color options. 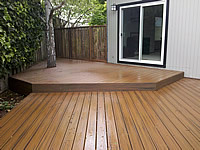 Decking does not have to follow a square pattern. Materials with recycled content do not need to be re-stained, and feature a wood grain finish within its profile. Arbors can match the house trim color. They can serve a duel function in protecting the residence from stray golf balls through the use of a tighter than normal lattice pattern. Columns made from the same material as the home act to give a feeling of place to a site, and can also hold the mailbox and safety lighting. Craftsman gates give ample opportunity for creativity in the setting of the home. 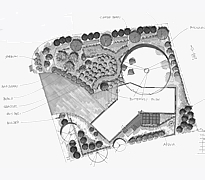 They allow a dramatic start to a garden walk, and can serve to obscure bland areas or otherwise allow for more privacy. 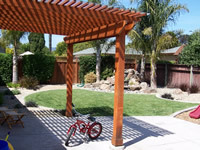 Outdoor kitchen arbors give a shade value for hot summer days. Heat lamps can be placed in the rafters for cold nights. 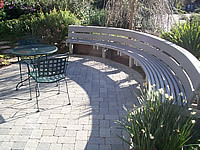 Built in seating allow for cushions. A countertop and grill make a for a suburb garden party setting. Keeping it cool: Lots of glass provide for some spectacular views but can get hot on a southerly exposed wall. 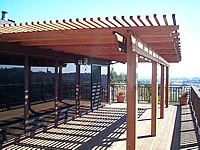 The solution is a deck covering to provide passive cooling to the home.